In Colombia, Artist Renders Tons Of Rebel Guns Into Floor Tiles Under Colombia's peace deal, FARC guerrillas turned over their weapons to the United Nations. Now many of them lie in the ground of a Bogotá museum. 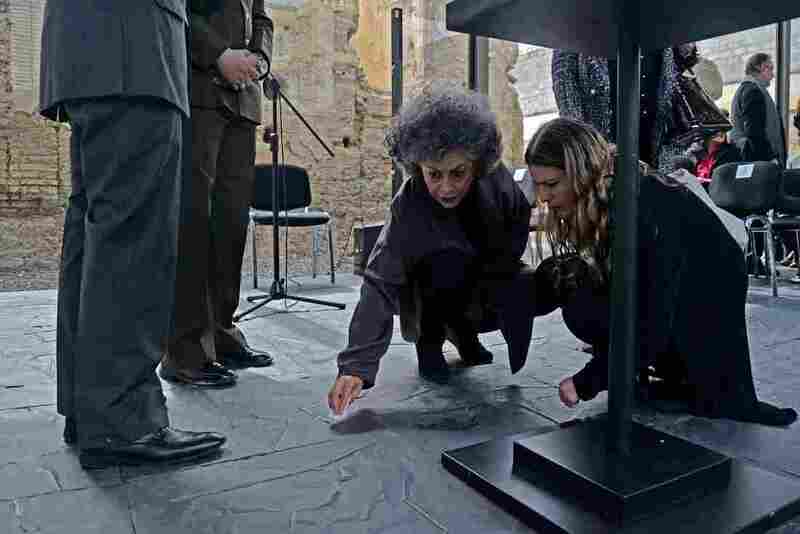 Colombian sculptor Doris Salcedo (center) cleans a spill on the floor during the pre-inauguration of her peace monument titled Fragmentos (Fragments), for which she used metal melted-down from the weapons handed over by FARC guerrilla fighters to make the floor, in Bogotá on July 31. Salcedo, one of the country's best-known sculptors, is building a monument to mark the end of Colombia's half-century-old guerrilla war, using the scrap metal from leftover rebel machine guns, automatic rifles and pistols. These and other weapons were used to kill more than 220,000 people in a war that began in 1964 and ended through a peace treaty signed in 2016. "The fact that these guns have been destroyed means that many, many lives have been saved," Salcedo tells NPR in an interview. Under the peace accord, the Colombian government and the Revolutionary Armed Forces of Colombia agreed that rebel munitions would be turned over to United Nations inspectors, then melted down and used to create three monuments: one at U.N. headquarters in New York, one in Havana, Cuba, where the treaty was negotiated, and one in Bogotá, the Colombian capital. Salcedo is in charge of the Bogotá site located among the ruins of a colonial-style house a few blocks from the presidential palace. But she initially wanted nothing to do with the project. Although the war ended in a stalemate, the guerrillas wanted Salcedo to build 48 mini-monuments — similar in style to the grandiose Arc de Triomphe in Paris — to honor each of the 48 rebel battalions that disarmed. "It is wrong to make a monument, a conventional monument, with arms," Salcedo says. "A conventional monument ... is usually a vertical piece placed on a pedestal that we should all look up [to]. So I thought arms do not deserve to be there." Instead, Salcedo turned the concept of a monument — and the supremacy of arms — upside down. She mixed 37 tons of metal from the smelted weapons with cold rolled steel to form tiles. These gray slabs, some of which weigh more than 100 pounds, will become the floor of a new art gallery. Salcedo calls the result an "anti-monument." "I wanted to invert the power relationship that a man carrying a gun has [by] having us Colombians being able to walk on the guns," Salcedo said. Former FARC commanders, who had to sign off on the design, initially resisted. But Salcedo convinced them by pointing out that rebel fighters, many of whom joined the FARC as children, were also victims of the conflict. Dressed in black as she tours the museum site, Salcedo appears to be in mourning — which is a major theme of her art. Salcedo focuses on the human cost of political violence and upheaval. One of her best-known exhibits was the 548-foot-long gash that she opened up in the floor of the Turbine Hall of the Tate Modern art gallery in London in 2007. The crack suggested racial divisions, borders and the plight of immigrants. 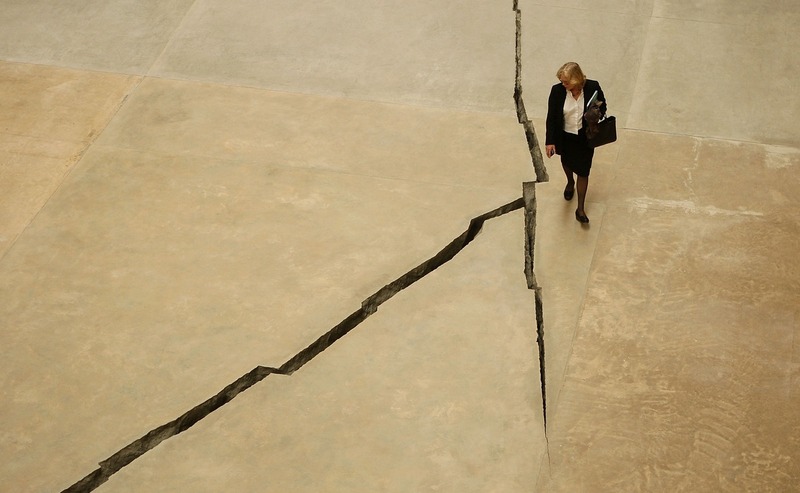 Salcedo's work Shibboleth is displayed at London's Tate Modern gallery in 2007. She opened up a snaking, nearly 550-foot-long crack in the concrete of the Turbine Hall. Memory and loss are also at the forefront of her work, in part, because as catastrophic events pile up, Salcedo says that people tend to remember only the last one. One example is the performance and sculptural piece November 6 and 7, 2002. It was unveiled on the 17th anniversary of a deadly 1985 rebel siege of the Palace of Justice in Bogotá, with Salcedo lowering chairs, one-by-one, from the roof of the rebuilt palace at the approximate time of death of the victims. I wanted to invert the power relationship that a man carrying a gun has [by] having us Colombians being able to walk on the guns. To help make the floor tiles for the Bogotá museum, Salcedo recruited women who had been sexually assaulted by guerrillas, army soldiers or paramilitaries. According to Colombia's National Center for Historical Memory, more than 15,000 women and girls suffered from sexual assault during the war. Salcedo gave the women mallets to pound the metal from the weapons. "As we hammered along they started telling me what kind of experiences they were hammering away. So it was a completely cathartic experience," she says. "It generated, I think, the energy this floor has." 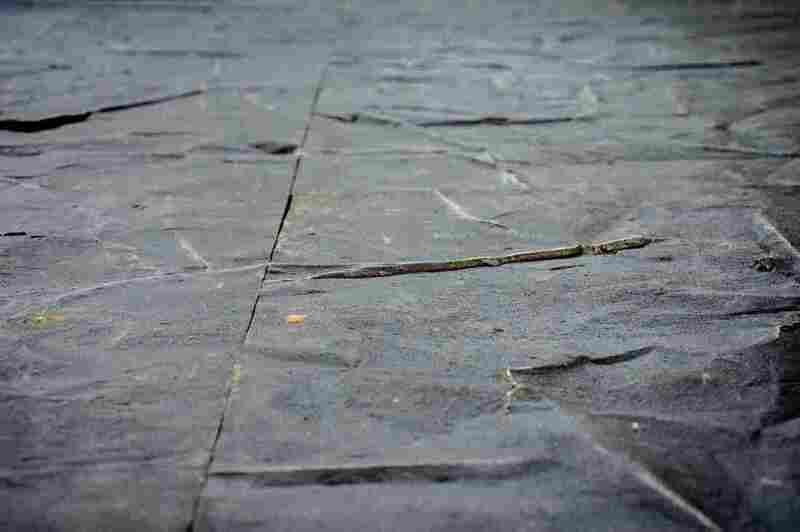 Salcedo's art space Fragmentos includes a floor made with tiles from tons of smelted weapons collected from the FARC rebels, in Bogotá. One of the women, Ángela Escobar, says that when she took off her earplugs the hammering resembled the sound of firefights. Another, Fulvia Chunganá, who was raped by a FARC guerrilla fighter in 1990, says that pounding the metal was so difficult, that tears came to her eyes. But now she says of the destroyed weapons: "To see them there, as part of the floor, is very gratifying." All told, they made 1,300 tiles for the museum, which will open in December and exhibit art relating to the Colombian conflict for the next 52 years — the amount of time that the war lasted. However, violence is flaring up again as drug traffickers move into areas once controlled by the guerrillas. Indeed, one of the reasons Salcedo named the museum Fragmentos — Spanish for "Fragments" — is because Colombia's peace is incomplete. "I am very much into reality, and the reality here is painful and it's difficult," she says. "In Colombia we learn not to trust, not to hope for a lot. And yet the making of each single work of art is proof that there is hope."